Many of us have our favourite devotions to our Blessed Mother, the Virgin Mary, under various titles, such as Our Lady of Fatima, Our Lady of Lourdes, Our Lady of Perpetual Succour and our Lady of Good Health. 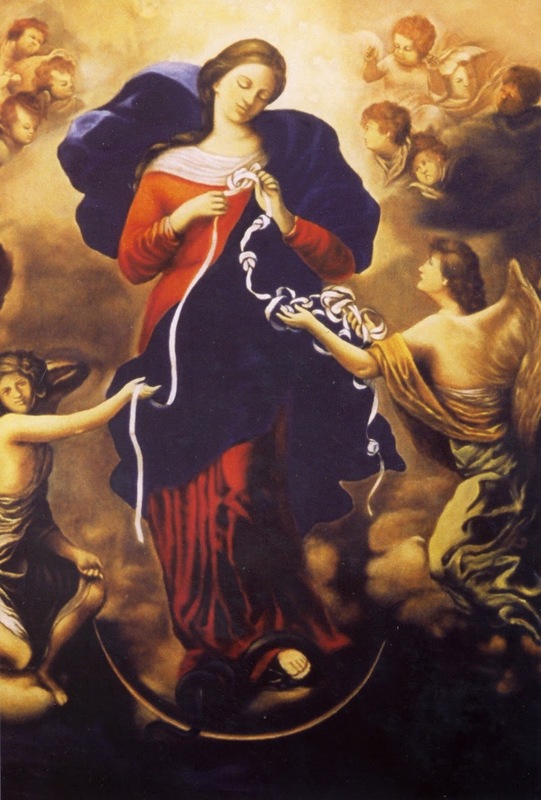 Recently, our Holy Father, Pope Francis has introduced to us one of his favourite Marian devotions, one which remains obscure in many parts of the world, a devotion to Our Lady, Undoer of Knots, or her original German title, “Maria Knotenloserin.” He encountered this 17th century painting of Our Lady Undoer Knots during his stay in Germany in the 1980s and has become a personal favourite for contemplation. Praying before this icon brought great solace to the then Fr Jorge Bergoglio as he struggled to make sense of the troubles that were taking place back home in Argentina. He brought a postcard of the painting back to Buenos Aires on his return to Argentina and has ever since promoted devotion to this visage of our Lady. The concept of Mary untying knots is derived from a work by St. Irenaeus of Lyons, Against Heresies. In this book, he presents a parallel between Eve and Mary, describing how "the knot of Eve's disobedience was loosed by the obedience of Mary. For what the virgin Eve had bound fast through unbelief, this did the virgin Mary set free through faith." The first aspect of her faith, according to our Holy Father, is that “Mary’s faith unties the knot of sin.” The knot of sin was precisely the knot of disobedience, the knot of unbelief. Sometimes, when our lives get entangled in sin, we get all knotted up. One can appreciate the image of a knotted ball of string, knotted wire mesh, knotted circuitry, knotted veins and arteries. They do not only pose an inconvenience. They are terminally dangerous and sometimes can be life-threatening. But Mary’s faith gives us hope and comfort. Her faith demonstrates this truth: “Nothing is impossible for God’s mercy! Even the most tangled knots are loosened by his grace. And Mary, whose “yes” opened the door for God to undo the knot of ancient disobedience, is the Mother who patiently and lovingly brings us to God, so that he can untangle the knots of our soul by His fatherly mercy.” Mary’s faith points us to the true Undoer of Knots, it is God Himself. I hope that by now my homily has not gotten all of you knotted up? I guess many of you would have to be pleading with Mary, Undoer of Knots to help you understand what has this image, Pope’s Francis catechesis and the Feast of Assumption have in common. Don’t worry, just pray, “Our Lady Undoer of Knots pray for us” and “Presto”, clear understanding! Well, if the fog hasn’t cleared up from your minds, it means only this – bear a little longer with the rest of this homily. The event of the Assumption of Our Lady, Mary at the end of her earthly life, being assumed into heaven both body and soul, is the perfect illustration of the three aspects of Mary’s faith as enunciated in our Holy Father’s catechesis. If sin is ultimately the cause of death and corruption, then Mary’s Assumption proves that the grace of God is far stronger and more formidable than the gates of Hades. God had already untied the knot of Original Sin in the Virgin Mary. But the ultimate knot that needed to be undone is death, the fruit of sin, which Jesus accomplished through his death and resurrection, the effects of which Mary shared at her Assumption. Her Assumption was not merely spiritual in nature but also bodily, thus confirming the veracity of the Incarnation. When the Son took flesh in her womb, when God chose to become man, it brought about the greatest unprecedented evolutionary change in man – as the fathers of the Church were prone to preach – “God became man so that men may become gods!” Mary’s bodily flesh had now been sanctified by her conception of the Divine seed, and what happens to Mary, also becomes the promised hope for all humanity. Finally, if Mary’s faith is a pilgrimage, today, we find that final destination – it is heaven. If Mary followed her Son Jesus throughout her earthly life, it would certainly be obvious that she should follow Him after death, the path of faith’s journey finds its logical conclusion – communion with God for all eternity. Coincidentally, there is another apocryphal story that dates from the Middle Ages. It’s the story of Mary’s Girdle, a knotted belt that she wore, and St Thomas – yes, the same Doubting Thomas figured in the post-resurrection story of Jesus appearing to his disciples. In the story of the girdle, at the Assumption of Mary, where the other apostles were present, Thomas once again missed the occasion (being on his way back from India), so the Virgin Mary, aware of Thomas' skeptical nature, appeared to him individually and dropped the girdle she was wearing down onto him, to give him a physical proof of what he had seen. In another version, only Thomas actually witnessed the Assumption, and the Virgin left the belt as a proof for his story to the other apostles (a neat inversion of the Doubting Thomas episode). So, here’s a little neat legend that ties the event of the Assumption with the little matter of knots. The Solemnity of the Assumption gives each of us great hope as we contemplate this one facet of the beautiful woman of faith, our Blessed Mother. Mary is not only the undoer of knots for poor petitioners coming to seek her intercession. She would without hesitation point to the fact that it is indeed God, the God whom she magnified in song, in word and in deed, that truly undoes the many knots in our lives. Mary moves us by example and prayer to grow in faith in God's grace, to be receptive to His will, to convert our lives through sacrifice and penance, and seek that everlasting union in the heavenly Kingdom.